Almost everyone is interested in music in some way. I am not more interested in music than ordinary people but since it is one of my interests just as any of my interests it should be a part of the series of blogposts about my interests. I’ll try to write about what music means and has meant to me during my life. First something about creating music. When I grew up making music was a part of my family’s life. For example I had a brother who sang more than he was talking. Even though my parents had quit playing instruments it was a matter of course for me and my brother to play instruments as well. 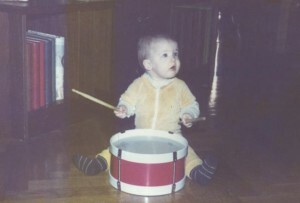 As really young kids we played with instrument toys such as drums and guitars. But when we became older it was time to play real instruments. Since I always have wanted to do the straight opposite as everyone else I chose to play the trombone. I was one of the only two girls playing trombone in Norrköping. After five years of industrious trombone playing I realized that I have no tactfulness, by then it had been long time since I had realized that I can’t sing and so I put the music making on the shelf. What I have enjoyed more in life than making music is listening to music. As kid I was basically fed with Carola by my parents. When she won the Eurovision song contest with Fångad av en stormvind in 1991 I thought she was the best artist ever (I still know the lyrics by heart). I still like Carola, she’s a great singer and artist but it is not the music I mainly listen to. 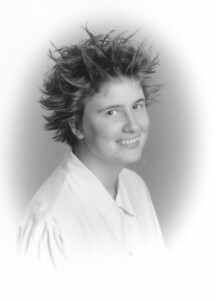 During my teenager years I was a punk rocker. I started to listen to swedish punk when I was around 12 years old, at around 15 I discovered the skatepunk and after that it was only punk that existed for me. Swedish punk, english punk and american punk. Some of my favourite bands back then were Dia Psalma, Charta 77, The Clash, Blink 182 and Lagwagon. Me with spikes in 2001. Five years ago I regained my common sense and realized that there are other music than punk rock music worth listening to. I started to listen to rock, pop, some synth music and so on. Still I don’t listen to most of the music played on the radio but I have a much broader spectrum of music that I listen to. Since Spotify came I am also listening even more to music. Spotify is constantly running on one or two of my computers these days. Some of my most played artists are Coldplay, Melody Club, Sigur Rós and Gavin DeGraw. The punk rock artists are rare in my playlists to be honest.